Best Buy today reported that it will be extending the Buy Back program and will offer “future proof” smartphone purchases until Feb 26. Check out the info graphic to get an idea of what the buy back program is. The program can be availed through all Best Buy and Best Buy Mobile standalone stores. Best Buy said that it had received good response from customers who wanted to update their tablets and mobile phones. 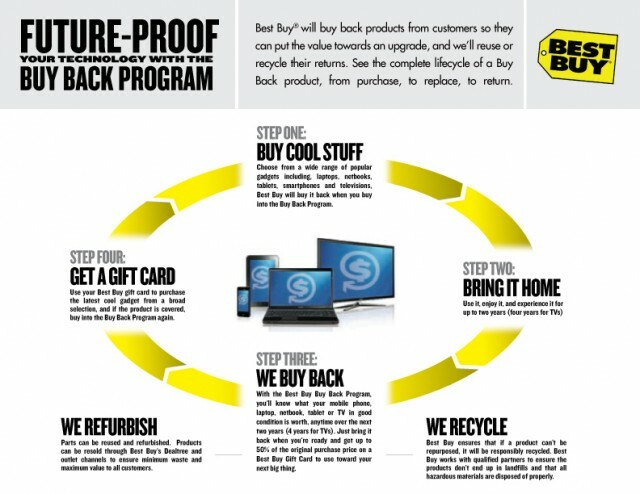 You can purchase the Buy back program when purchasing a new product from Best Buy. The program gets you up to 50% discount on the original price of the product. Best Buy gives you back the discounted money via a gift card provided the product is in good working condition. Previous Twitter is for Sale!